Last week, I was fortunate to be asked to cover a few events for my friend, Jessica Shyba at Momma’s Gone City. You can find this post on her website. 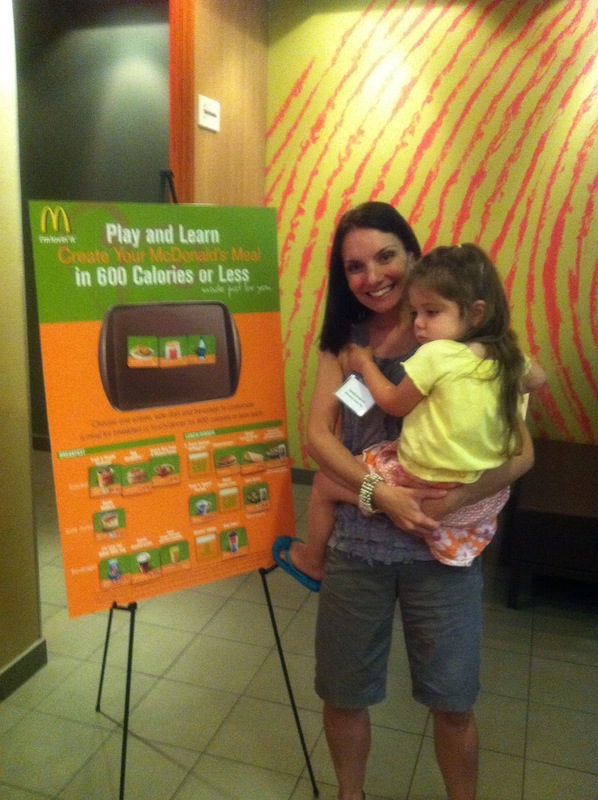 My four-year-old daughter, Molly and I went first to McDonald’s in the Chelsea section of Manhattan for the launch of the new Happy Meal, an event hosted with Moms and the City. I remember Happy Meals from my childhood. Oh, do I remember them well. Growing up in the suburbs lent itself to drive-thru cuisine. It is less that case in the city. I don’t think my three children have been to a McDonald’s other than during a road trip the Cape Cod. 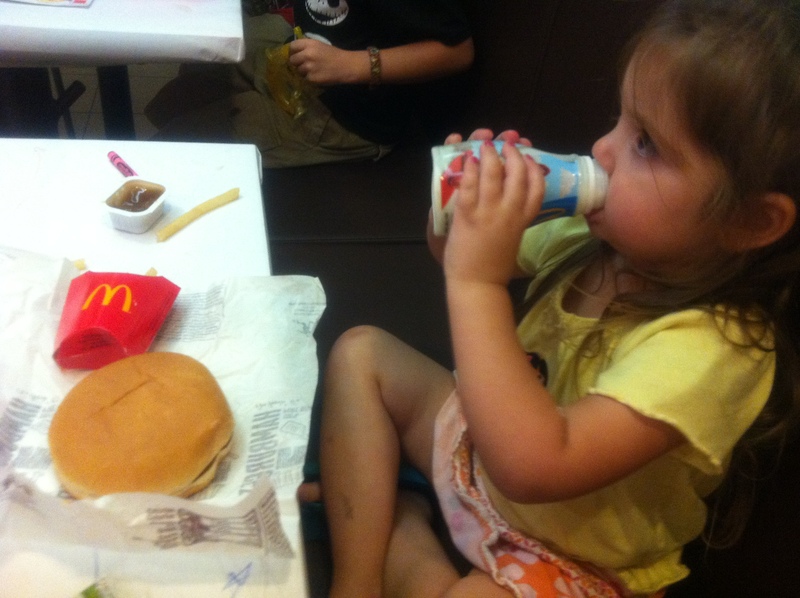 While my husband is a life-long McDonald’s fan, I gave up fast food (except when I’m pregnant), and I would rather my kids not develop a taste for it–historically, the fried, the fatty, the super sized. Still, I went to the event open minded because as parents, we really have to be aware of available choices. And hungry. I went there very hungry. I was more than a little curious–and, did I mention, hungry?–about the new Happy Meal, which has always comprised a burger, cheeseburger or chicken McNuggets, standard fries and drink, along with a toy. I learned from the senior director of nutrition for McDonald’s, Cindy Goody, that in developing a balanced Happy Meal, McDonald’s is responding to to parents’ concerns and requests for healthier food choices and portion sizes. The newest version of the happy meal is basically this: included are a smaller sized fries, which total 100 calories, and apple slices with every Happy Meal. The choice of entree is still available, and there are low-fat and fat-free milks to choose from. And of course, there is a toy. One thing I found pretty cool and interesting was the Plan and Learn activity board at the event, showing different meal variables with the calorie counts. Kids are encouraged to put a meal together for less than 600 calories. I was a little disappointed that this wasn’t available as a take-away. I think kids would like playing with the pictures, while learning what a “meal” looks like. (I did mention this, so maybe soon?) A different version of this is available on the web site, complete with calorie counts for all McDonald’s products. McDonald’s acknowledges its huge responsibility as a brand that we rely on regularly to feed our hungry, growing, busy families. My concern is always that not all American families have the same options and opportunities when it comes to even basic needs. So it does make me happy that McDonald’s is taking steps toward helping parents provide easy, economical and better food choices. Am I now a converted fan of McDonald’s? Not necessarily, but I did feel better having Molly eat her new Happy Meal on the way home; and I gained a good understanding of the company’s goals and more comfort with the food choices. I will bring my children in to and enjoy the kid-friendly atmosphere of the restaurants and to try the popular Happy Meals as well . Gee… I wonder if they’ll like them!